Its been two weeks, and I can’t procrastinate any longer. 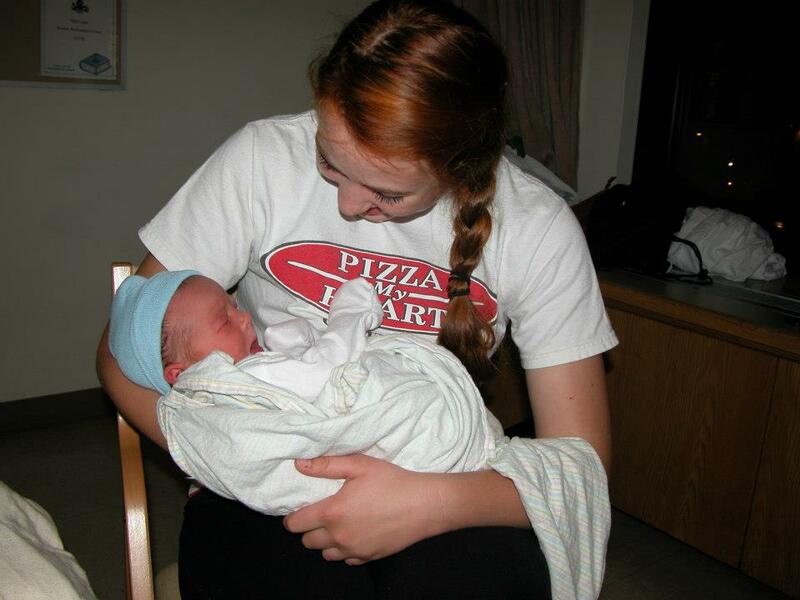 Two weeks since my trip to Pittsburgh to see my biggest, baddest sister have the biggest, fattest baby ever. But I didn’t really watch her have the baby. Yuck. Aaand I’m pretty sure half of the words I used to describe Kate and the baby aren’t really legit words. Two days after I started a new school year as a sophmore, I was already plain tuckered out and sick of high school, so it was real relief to be able to hop on a plane (for my very first time!) and head out to Pittsburgh to wait for the baby boy to arrive. Which meant..waiting..for the bus. And arriving..at the wrong bus stop. Pittsburgh is a beautiful city, and there was so much to see and do. Due to the fact I kept forgetting to bring along my camera, I was able to really sightsee and enjoy everything. Like getting a birds-eye view of the expansive, intricate city. And getting the view through a child’s eye. Dear little Princess Olympia is like no other. She’s makes for some great photo ops. Yes, we went up, down, and all around Pittsburgh. Everything was an adventure. Like the park-where you can ride ducks like they’re bucking broncos. and fly through the air like you’re Superman! 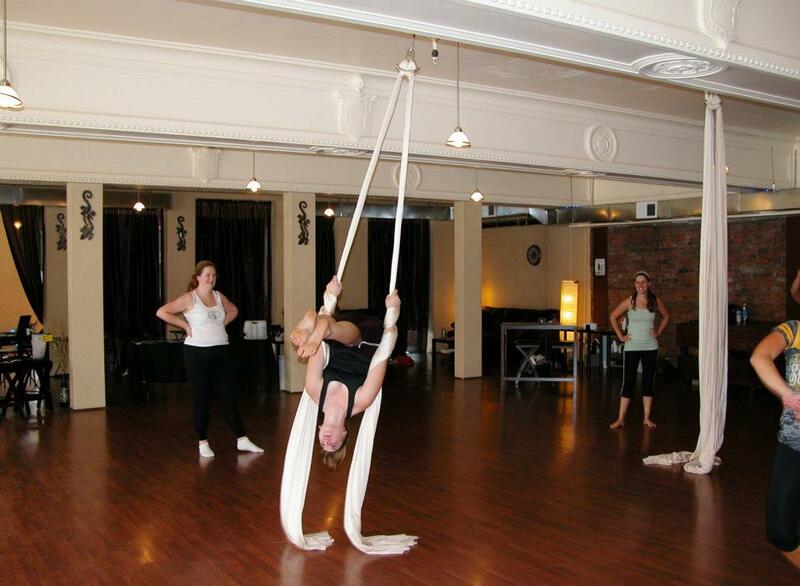 Speaking of flying through the air, Kate got me involved her awesome dance studio’s newest class-aerial silks. 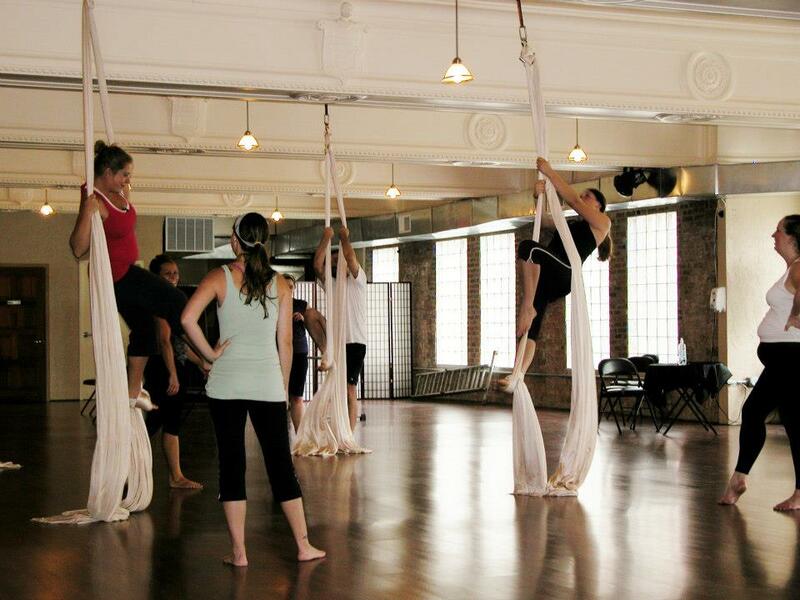 As a farm kid who grew up climbing trees, ropes, and anything else that I could fall from and break bones/scratch me up and leave scars, aerial silks was almost second nature. Until I woke up the following morning, and was seriously soar. Which would have been okay, had my older sister decided to lend a helping hand, literally, and give a back massage. But being two weeks overdue at the time, she wasn’t feeling too hospitable. Yes, that baby just didn’t want to be born. 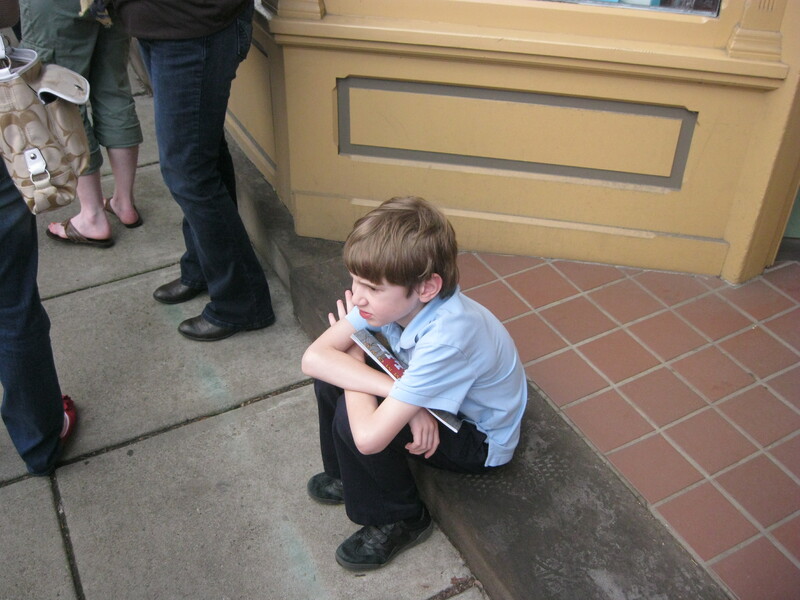 Which meant my mother and I elongated our trip, and I got to miss another week of school. Which was fine by me. Until I came back and collected all my homework. But the baby was born! Late, very late. And not on his own time. Because his own time, probably would have involved him being born walking. 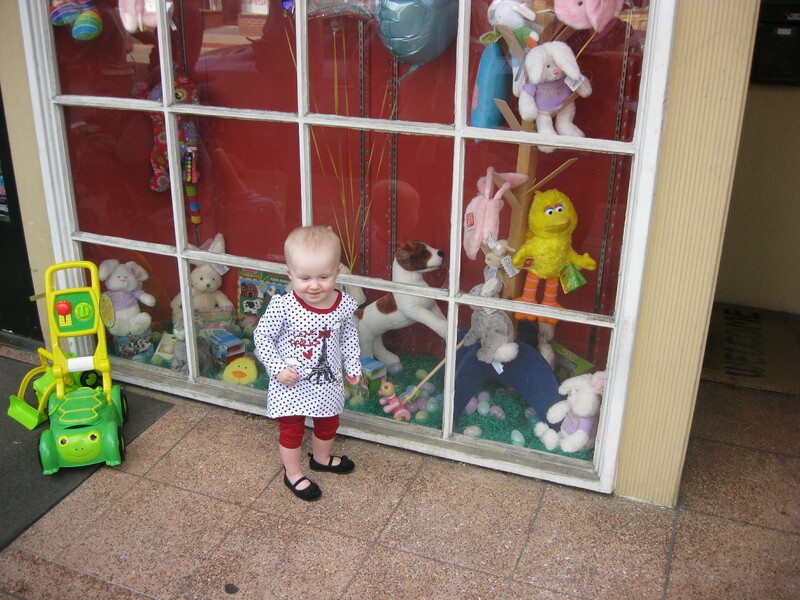 This entry was posted in Clare and tagged Adventure, Baby, Pittsburgh, Sisters, Travel on October 1, 2012 by sweetridgesisters. As many of you know, I am a barefoot country girl living in the (small) big city of Pittsburgh, PA. Granted, I do have a suspiciously large collection of high heels for a six foot tall barefoot country girl as I believe it is important to be prepared to play dress up at the drop of a hat. 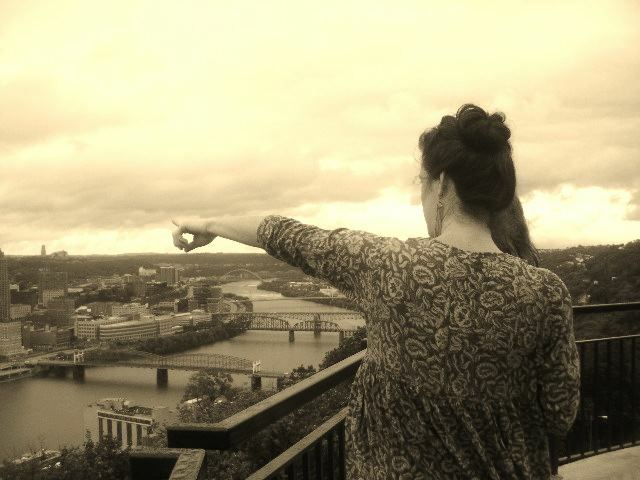 My love of the country, the city, high heels, and muddy fields led me to fall in love with the marvelous Pioneer Woman blog as soon as I first read it five years ago, when I was working with farmers in the Blue Ridge Mountains of Appalachia. I have been reading the blog regularly ever since. My three younger sisters are also fans of her writing, recipes, and lifestyle. 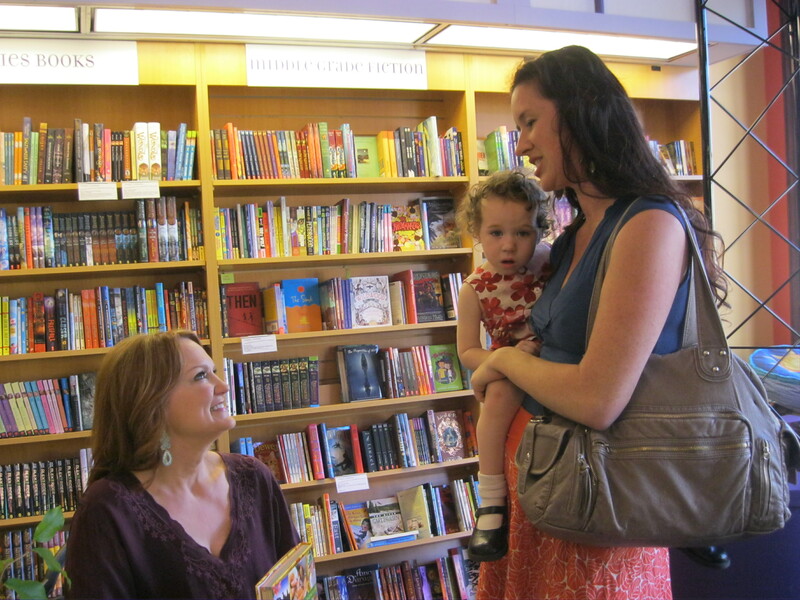 As Mary mentioned in a recent post, the Pioneer Woman blog was a definitely an inspiration for the Sweet Ridge Sisters- so when we noticed that Ree Drummond, the Pioneer Woman herself, would be heading to Pittsburgh for a book signing, we were all excited. 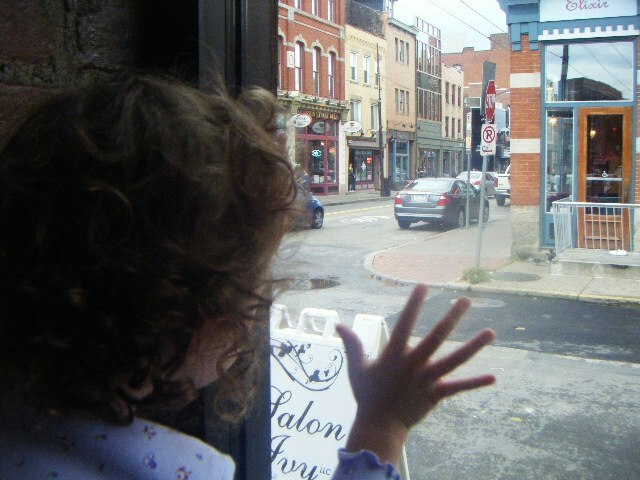 And so, yesterday I loaded my toddler into the car and headed out of the city of Pittsburgh along the Ohio River, past great rusting bridges and crumbling steel mills and on into the quiet streets of Sewickley PA, where the Pioneer Woman was scheduled to sign cookbooks and meet the masses. 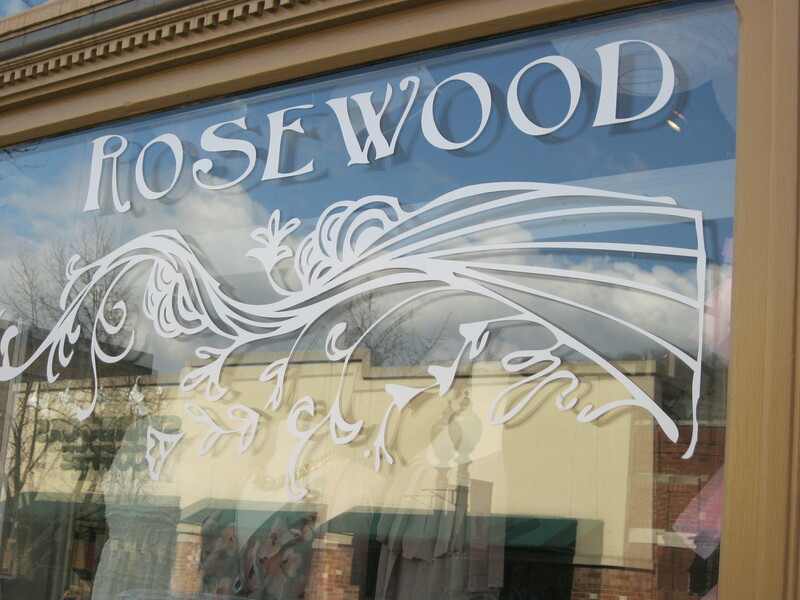 Sewickley is a suburb in the old fashioned small town American-as-apple-pie sense. 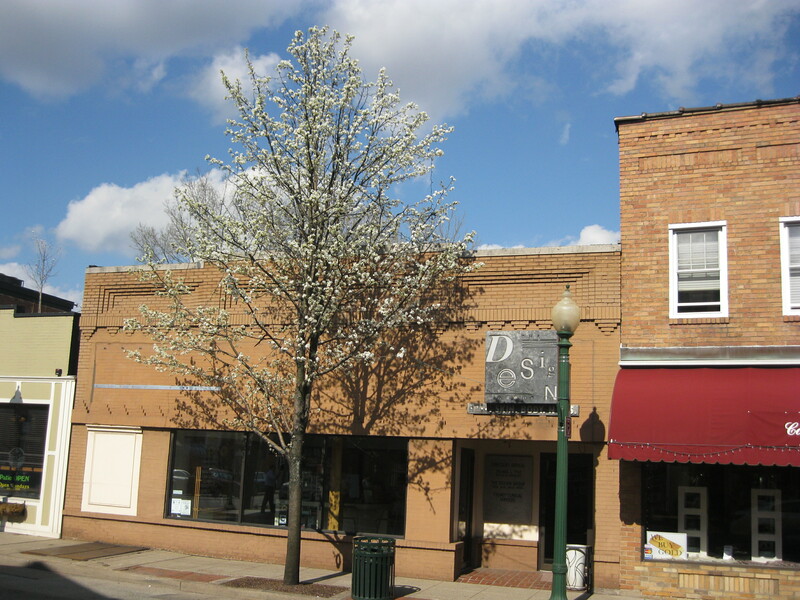 On this March afternoon, the skies were blue and the apple blossoms were in bloom. 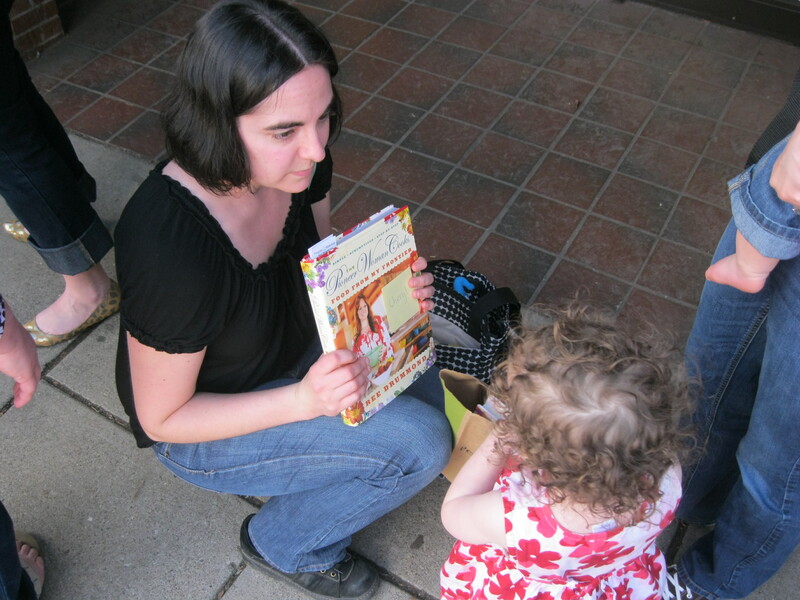 And the small town streets were lined with fans of The Pioneer Woman. 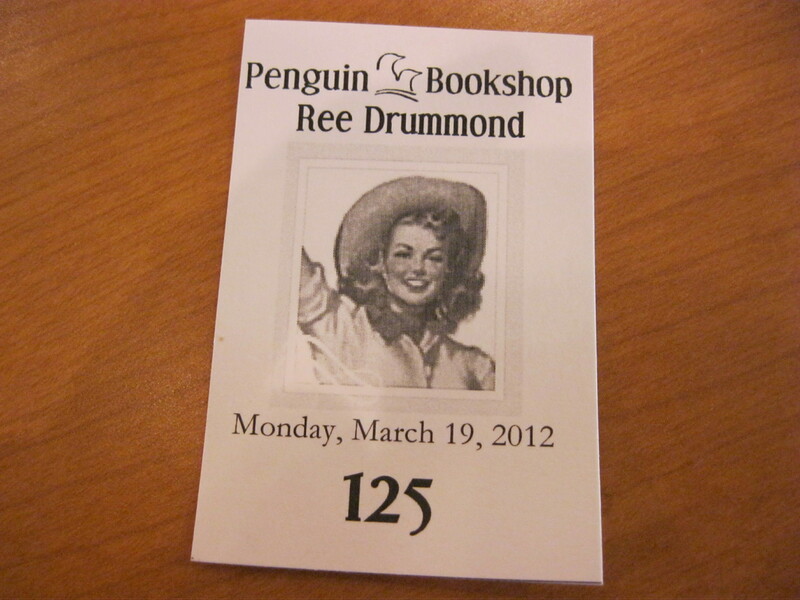 Just after I arrived, a very sweet Penguin Bookshop employee made her way through the line handing out tickets for the book signing. 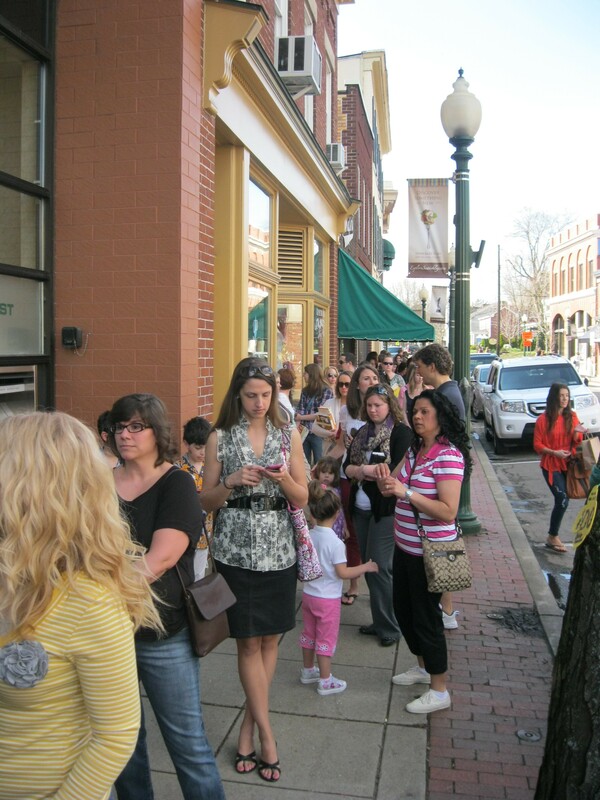 With half an hour to go before the signing began, we were 125th in line. Did I mention that I was wearing heels? Lovely, stylish, very high heels? This may not have been the wisest choice- but I don’t really regret it. At six four, I can clearly see over almost everyone’s head, which prevents claustrophobia. That is, I could see over heads during the moments in which I was not crouching down in an attempt to distract my almost two year old daughter. Luckily, I wasn’t the only one toting a small child. 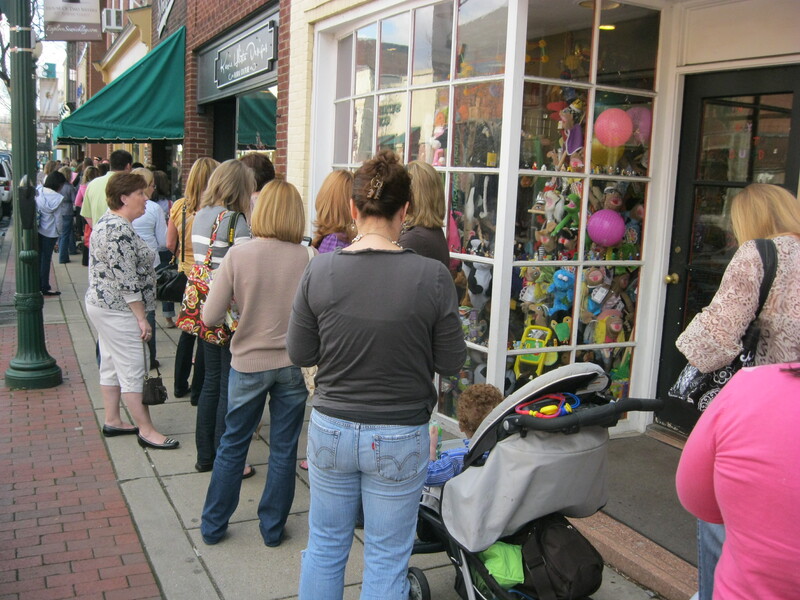 Even more luckily, as you can see, our first spot in line was conveniently located next to the bright window of a toyshop. Olympia was thrilled.. at first. But after 45 minutes or so, the allure began to wane. It was time for some serious distraction. 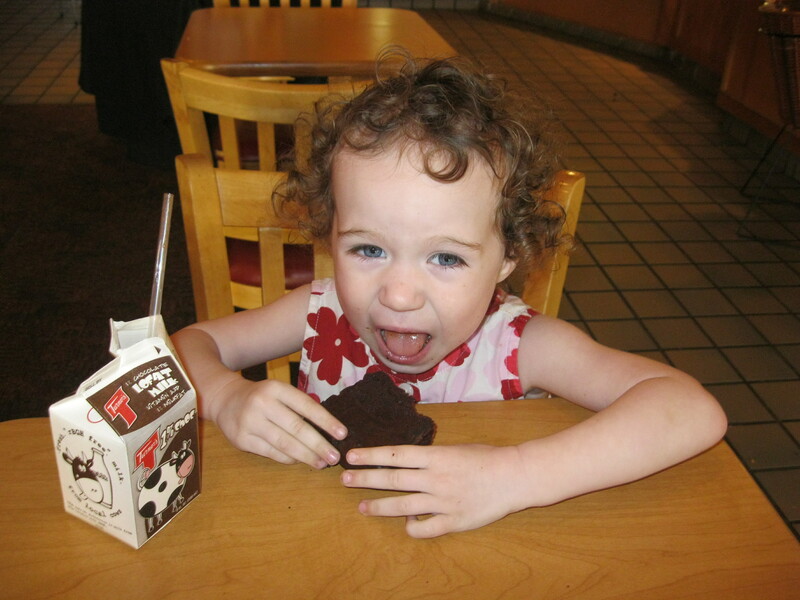 A quick stroll down the street yielded chocolate milk and a brownie. While this was immediately effective in cheering her up, perhaps the next time I am in a public place I will not feed my child so much sugar and then ask her to stay still for another hour and a half. Still, we headed back to our place in the line with our spirits lifted. and the throngs of women were nice people. Good people. Happy people. The mood was very cheerful, and very polite. Even this young man was patient and polite. I thought he deserved a dramatic prize of some sort, he was so patient. 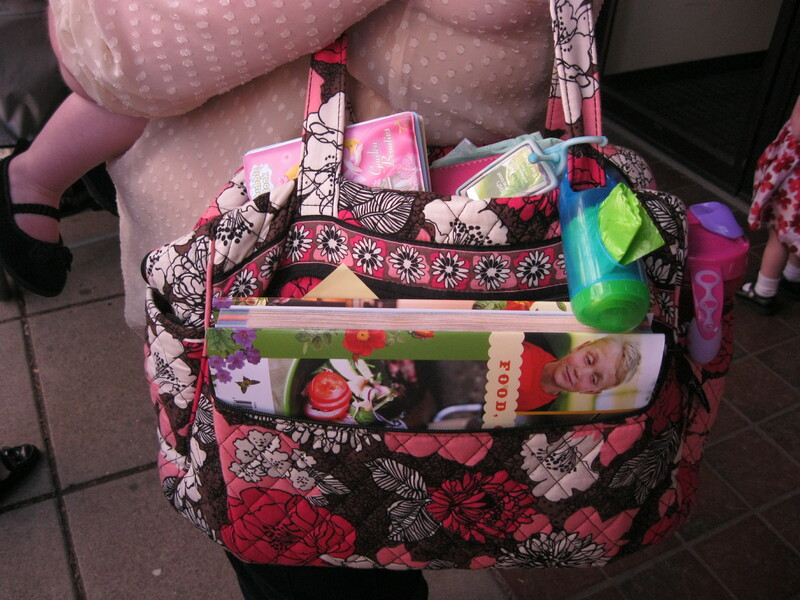 and here is a nice bag in the company of cheerful prints and nice shoes! It was all very stylish and impressive. 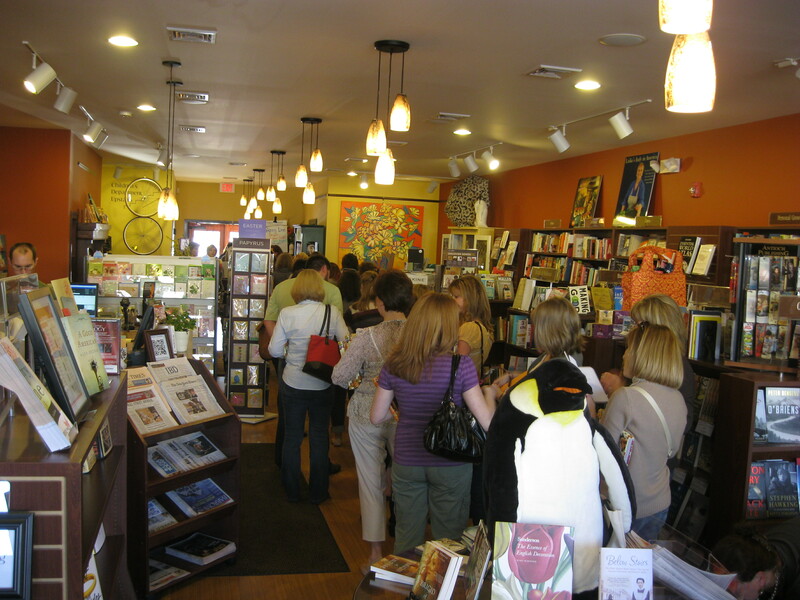 So was the interior of the Penguin Bookshop, when we finally arrived inside. 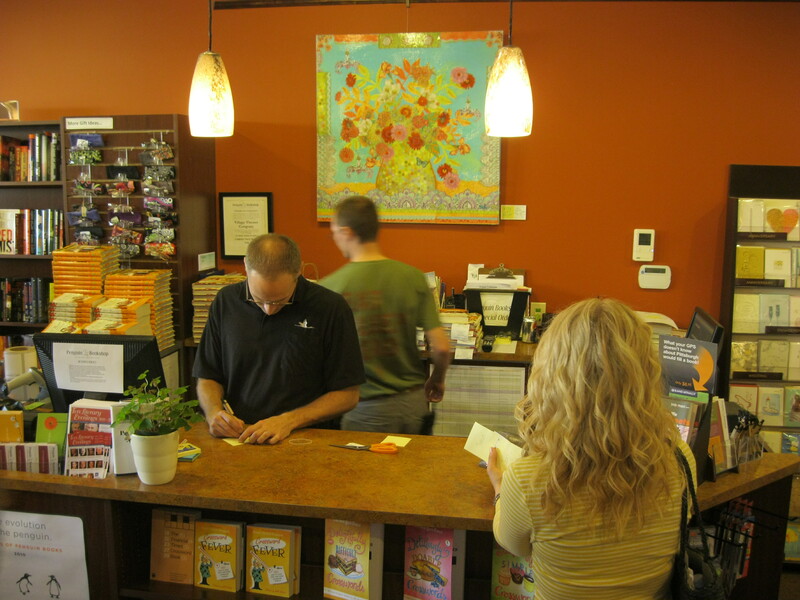 It was bright and cheerful and warm and welcoming. 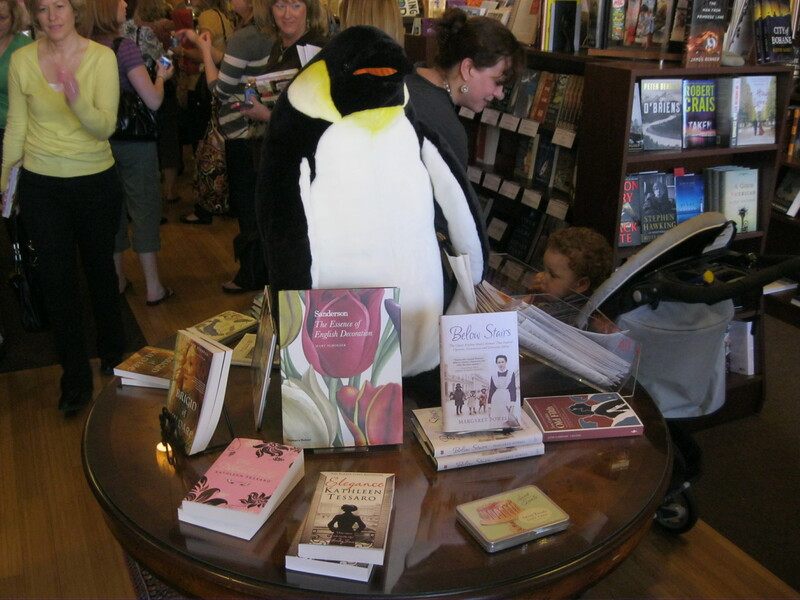 There were lots of penguins, as well as many books that I really wanted to read. Sadly I could not peruse them at leisure, as I was busy chasing the toddler who was starting to lose it, especially in the presence of so many books. And cards, and paper clips. She began to dance wildly in jubilation, clutching the latest Dominic Dunne novel in her sweaty brownie stained hand. 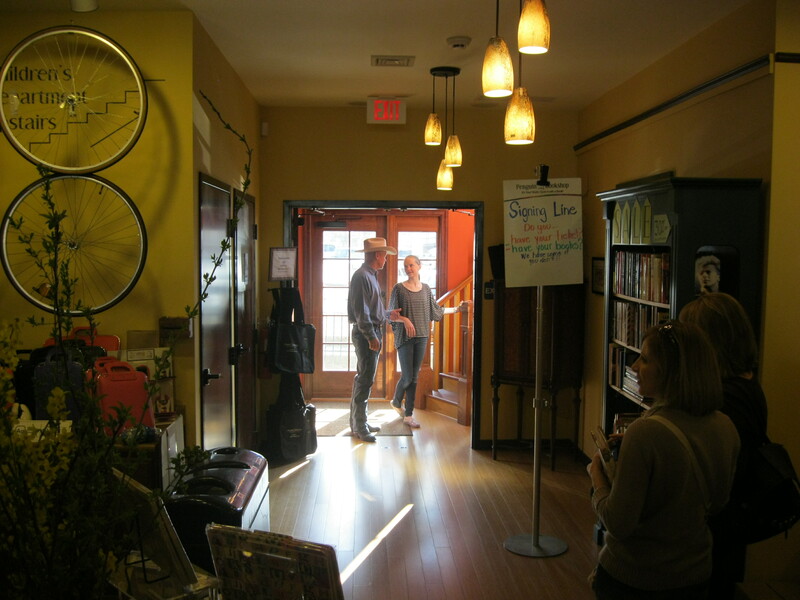 I lunged for her, just as a palpable rush of excitement swept through the crowd outdoors and into the bookshop sauntered Marlboro Man himself, along with his three youngest children. I will not lie. He is indeed a handsome man. They are one heck of a good looking and photogenic family. 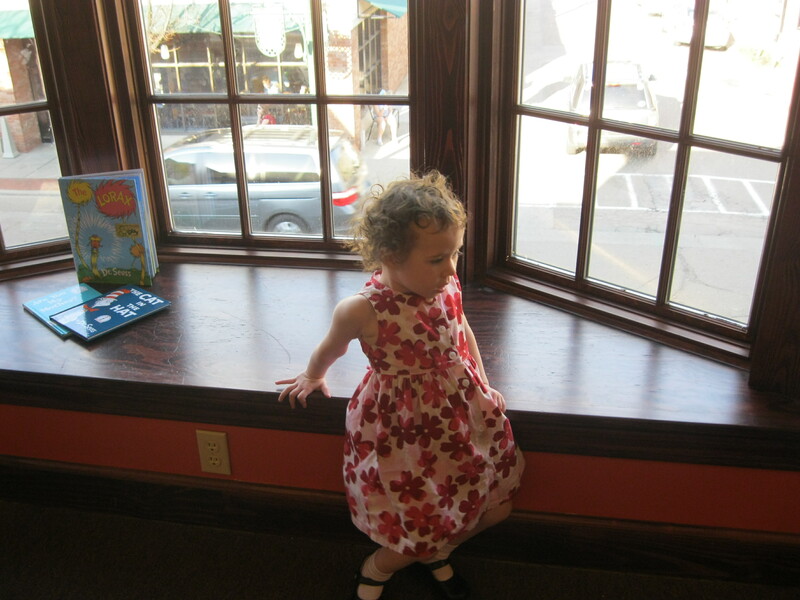 And on up into the Children’s Room, where the Pioneer Woman was seated at a wooden table with a gorgeous vase of daffodils, looking fresh and beautiful and radiating charm and ladylike composure. With good hair. And great boots. And incredibly well behaved children! All of them! 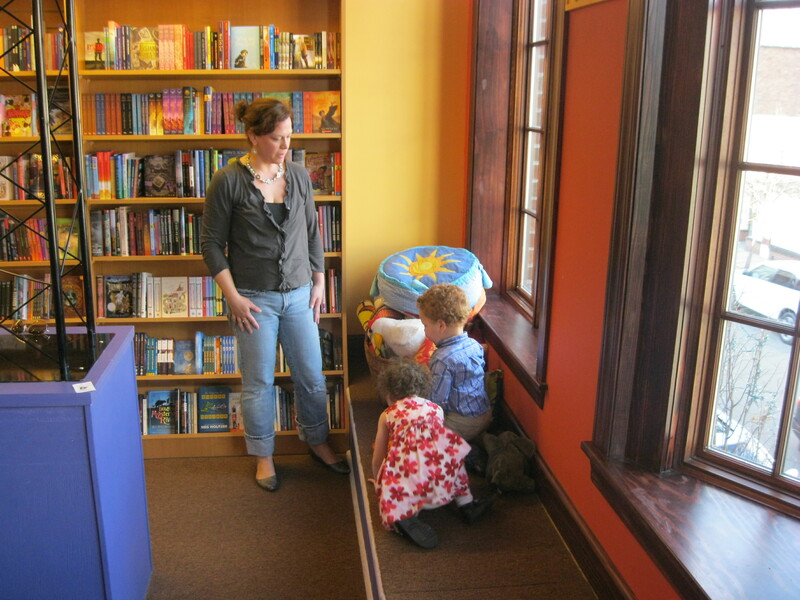 The Children’s Room was lovely- did I mention that Penguin Bookshop is a really, really beautiful bookshop? 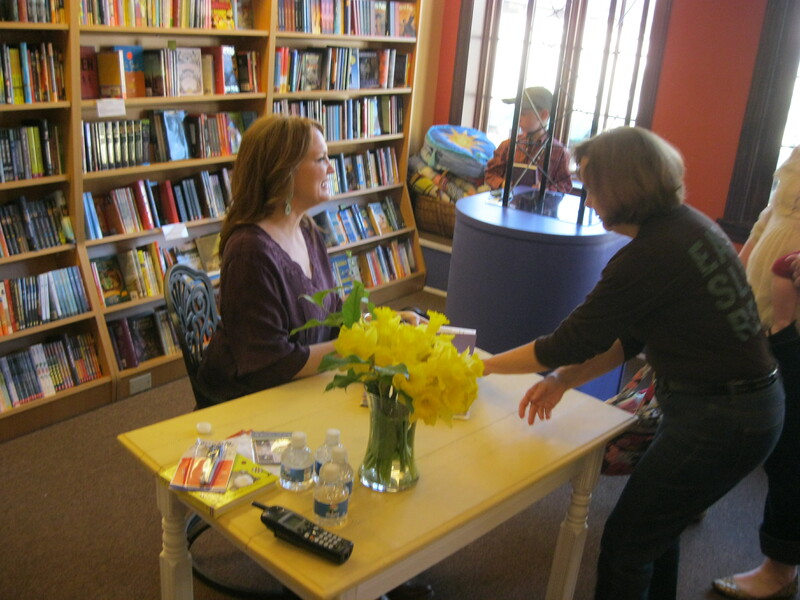 The Pioneer Woman was lovely too- really, I was incredibly impressed with her gracious manner and her warmth and real consideration for her many many many fans. 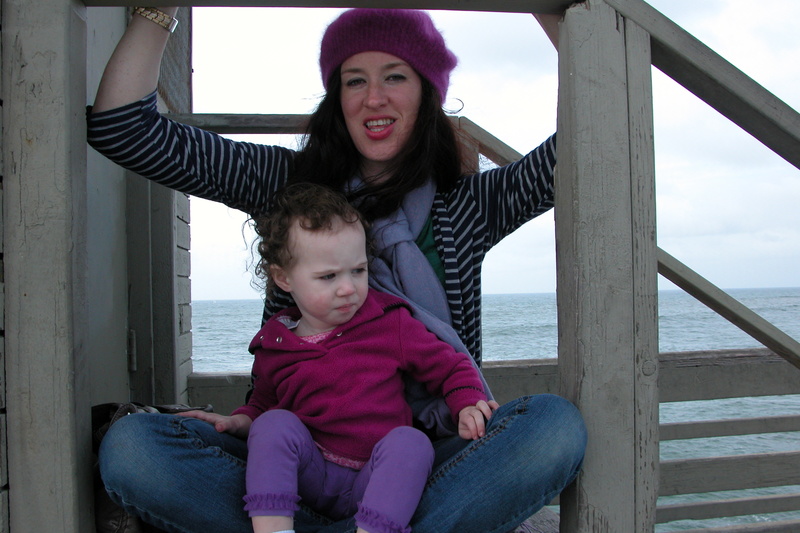 But I was distracted by the fact that my toddler was definitely on the verge of a breakdown. Note my limp, stringy hair! And my double chin! And the fact that, unlike the other Pioneer Woman fans, there are large jagged holes in my purse! 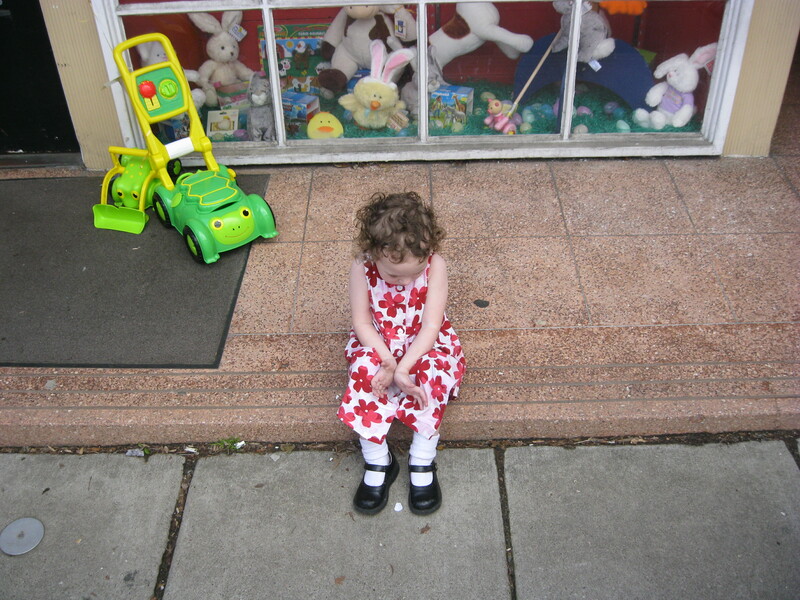 But it was definitely worth it, tearful toddler, high heels and all. 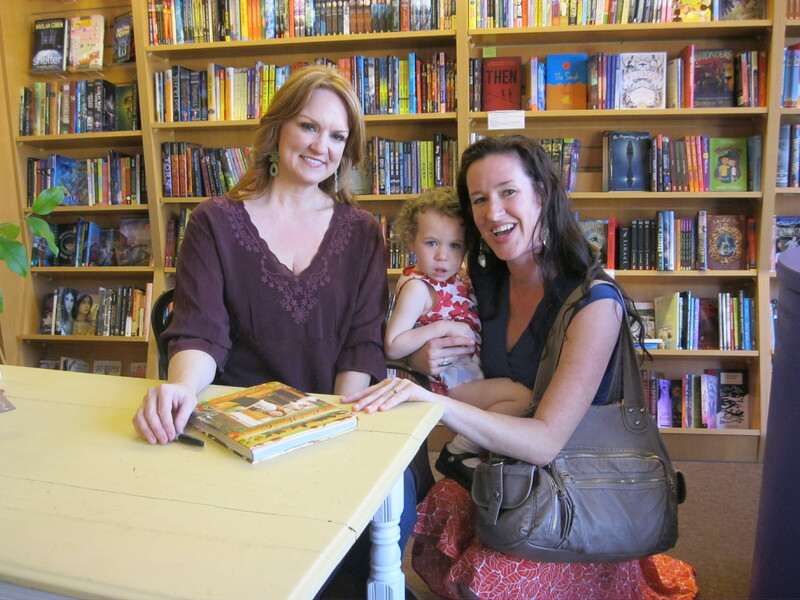 I got an autographed cookbook and a chance to tell Ree Drummond that she has been a great inspiration to all of my sisters, and to see for myself that she is a kind and lovely lady- with great hair. I may even brush mine, next time I leave the house. This entry was posted in Kate and tagged Adventure, Farming, Photography, Pittsburgh on March 20, 2012 by sweetridgesisters. 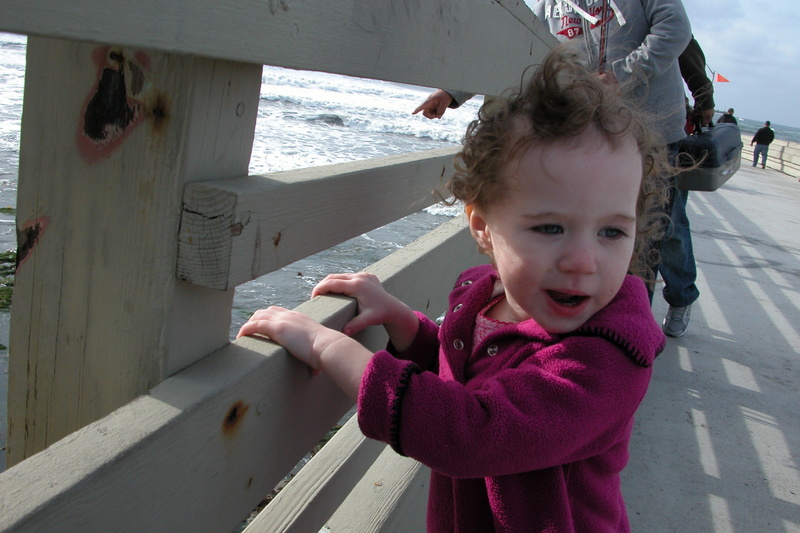 And during our California adventure, Olympia was able to see the sea for the first time. It took her breath away. 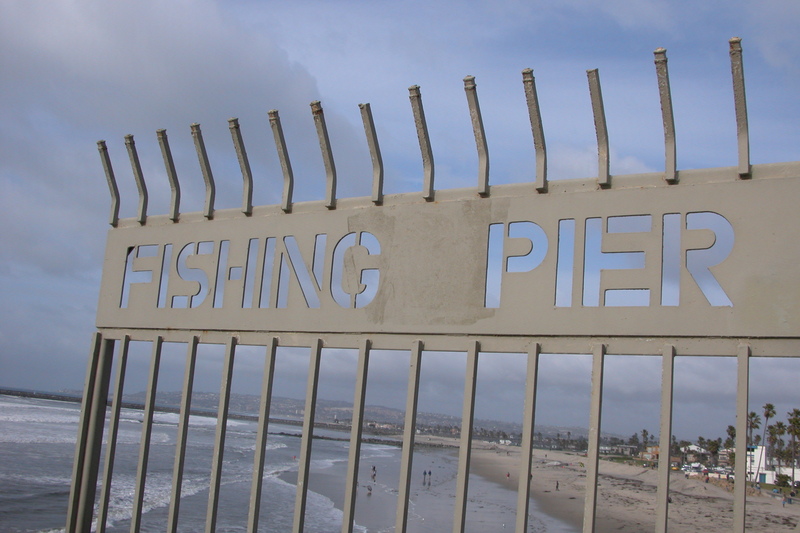 Or perhaps that was just the wind whipping the whitecaps and tearing through her hair. 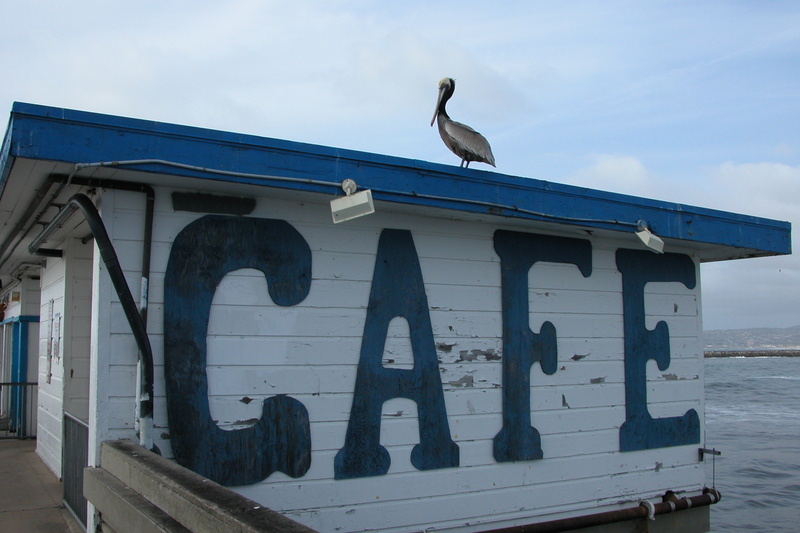 She loved the great grey waves and the circling gulls and this character in particular. And I loved the beauty of the weathered blue and white against the sky. I love the harmony of muted color found in a world scoured by sea and sand. 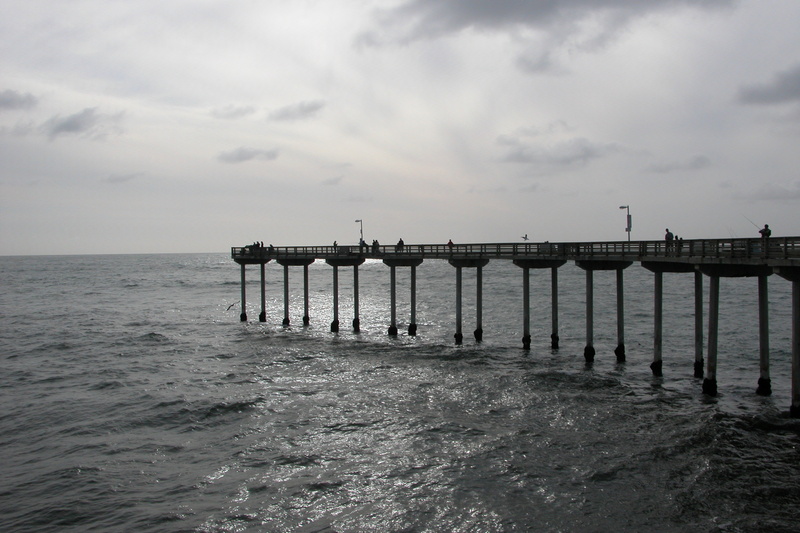 I am captivated by the angles of the pier and the texture of the worn wood against the rolling waves. And I am always lured by the opportunity for a good dramatic portrait. Olympia on the other hand? She’s ready to explore. I grew up on a on the edge of a ridge with the driftless valleys unfolding to the edge of the horizon. There is a boundlessness to the great sky and the rolling hills. Perhaps this is part of why I feel so akin to the ocean. 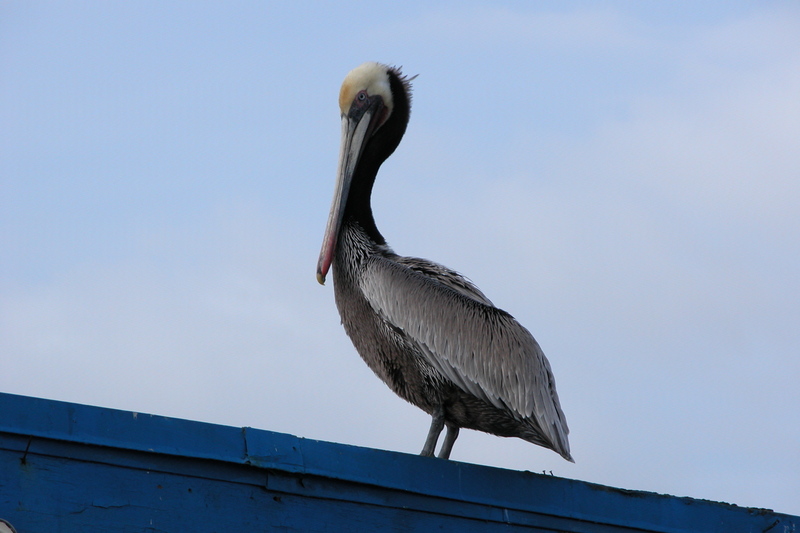 I love the whip of the wind and the sense of wonder and buoyancy and discovering the world anew. 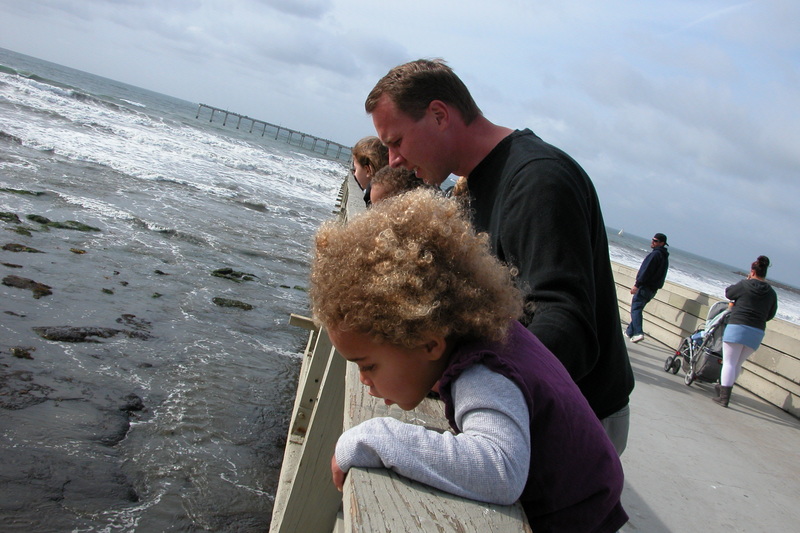 It was great to see the sea in Southern California- and to watch small children discover it as well. 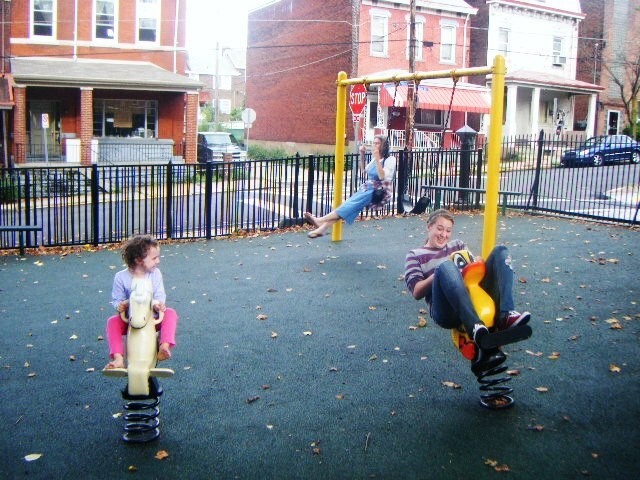 This entry was posted in Kate and tagged Adventure, Photography, Travel on March 14, 2012 by sweetridgesisters. Fashion has been the last thing on my mind of late. In fact, for the past two months my style has consistently been that of a depressed farmer reluctantly trudging out to the barn to perform chores. Perhaps if I lived anywhere near a farm, or actually had chores to perform, this would be appropriate. Sadly, I am instead in the midst of a city, and therefore highly likely to encounter other people instead of chickens and cows. Faded and baggy jeans, worn and beaten boots, oversized sweatshirts, and large caps to cover my tangled hair twisted into a glob on the top of my head have been my mainstays. Granted, this look can be done in a glamorous manner- but let me assure you that in my case, glamorous it is not. I have abandoned my beaten silver and painted wooden earrings and even stooped so low as to skip applying smoky eyeliner in the morning. It has been a sad state of things for me. In the midst of this style crisis, I received an alluring invitation in my email inbox last week. The invitation was from Maniac Magazine, a locally based monthly magazine covering Fashion, Celebrity, Style, and the Arts. Maniac was holding a special event for Pittsburgh bloggers at an abandoned storefront in the super hip South Side Works, showcasing the upcoming issue of the magazine. The invitation promised food and drink and complimentary massages- but most importantly for me, it offered a chance to put aside my tattered barn clothes, rip apart my closet, and attempt to find some semblance of stylishness. I built my outfit around a pair of pleather leggings buried in an old trunk full of dance costuming. These leggings cost me an exorbitant seven dollars three years ago, and have been worth every penny. Pleather leggings must be deployed carefully, but in the right context they can really make an outfit work. In this case, I paired them with a black Target minidress with jet beading on the collar. I topped that with the only designer item I own- a black Christian Dior blazer with a zebra print collar, purchased from Goodwill for four dollars. This blazer, like the leggings, requires caution. 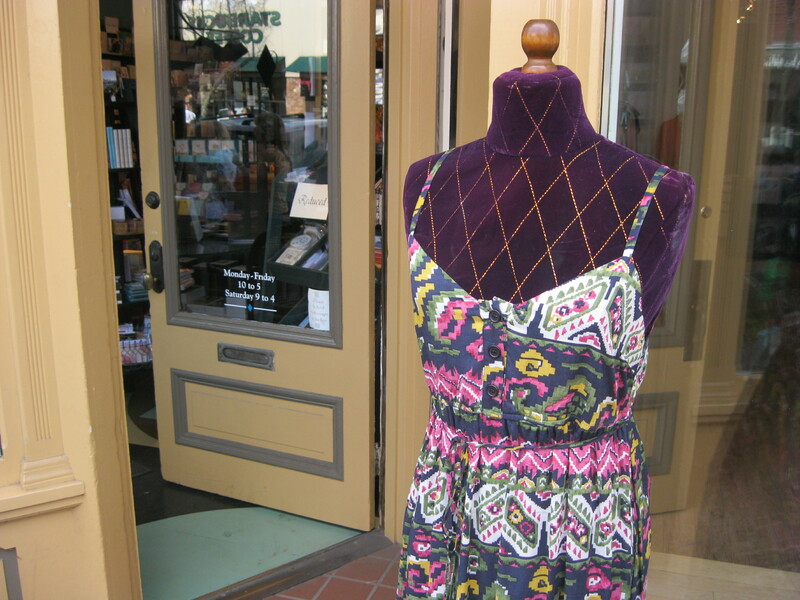 It has a cut that can be construed as classic or ridiculous, depending on how it is paired with the rest of an outfit. I personally like to throw caution to the wind and assume that being six feet tall and sticking my chin in the air will somehow carry me through wearing it without looking like a complete fool. In this spirit, I slipped on a pair of 80’s style pumps (also a thrift store find) and confidently applied a great deal of eye makeup. On my way out the door I noted that my hair was in rather desperate need of another henna treatment, and also that wearing pumps in the middle of winter was a chilly proposition. I grabbed a magenta mohair beret that my grandmotherly neighbor recently gave me, and headed out to see the world of the sophisticates. So sleek. 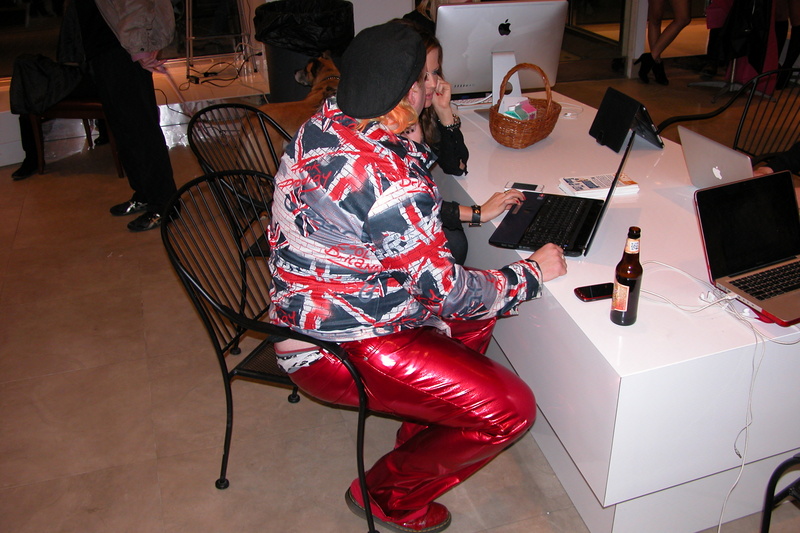 So stylish. So sophisticated. And it is a great cover, isn’t it? Inside the door, there were many fashionable people talking about fashionable things, and hip photographers on hand to document the action. 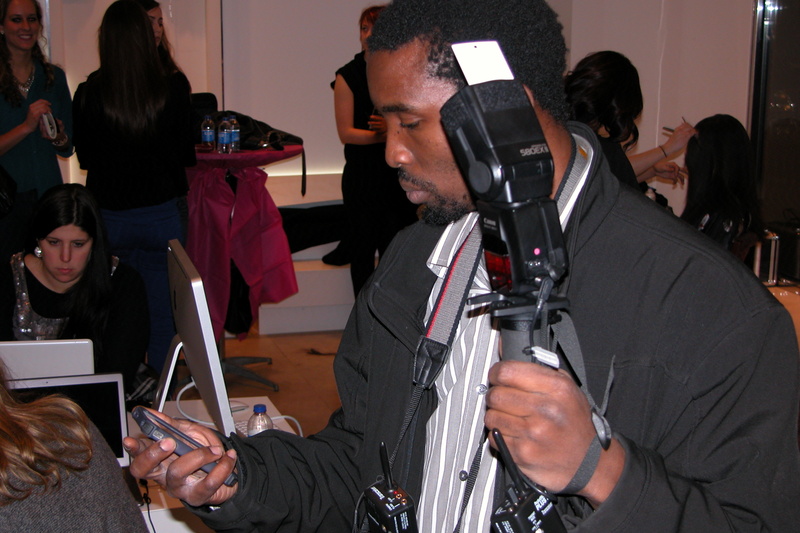 Here is the dashing Tobi Makinde of Makinde Photography. 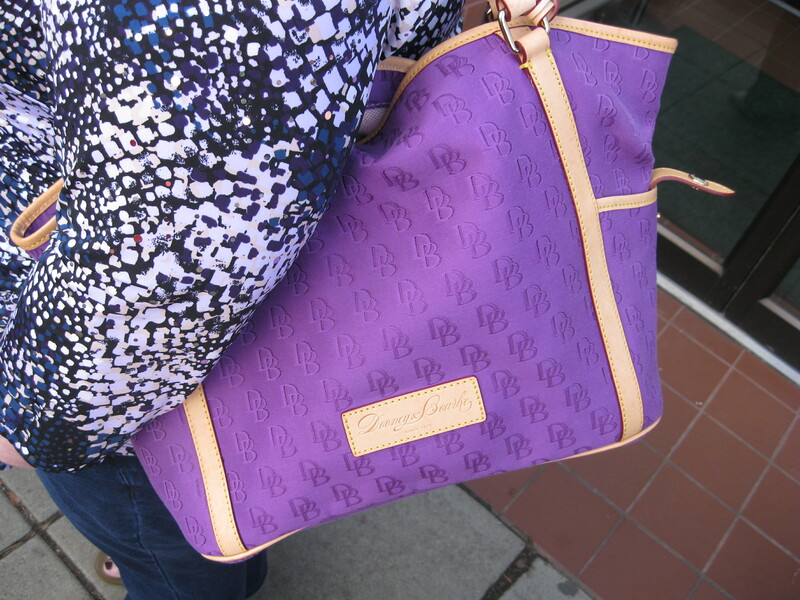 There were chic people wearing carefully chosen and colorful outfits and accessories. And of course, there were great shoes. Actually, great shoes and great tights and a really photogenic dog. I really do love those grey tights, worn by the blogger Nicole. You can read all about her dog, Gwendolyn on her blog as well, here. 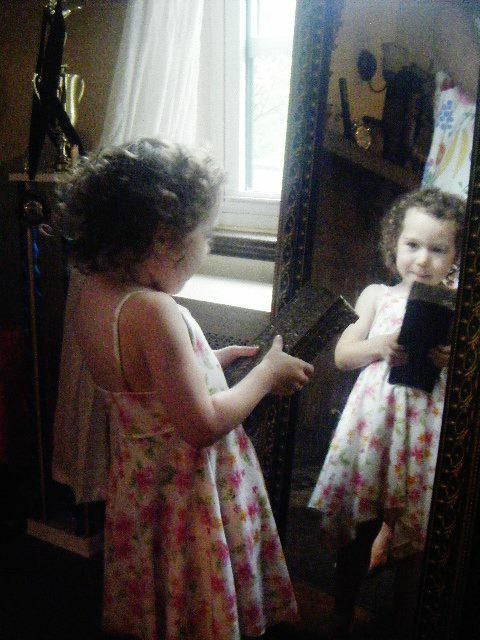 I am pretty sure Gwendolyn was the belle of the ball that night. In case the other attendees weren’t up to Gwendolyn’s level of fabulousness, there were hair and makeup teams on hand, ready to help party people take it to the next level. Staff from the Harmony Salon were providing instant trims, blowouts, and layering. Makeup artist Katherine Reel worked her magic. 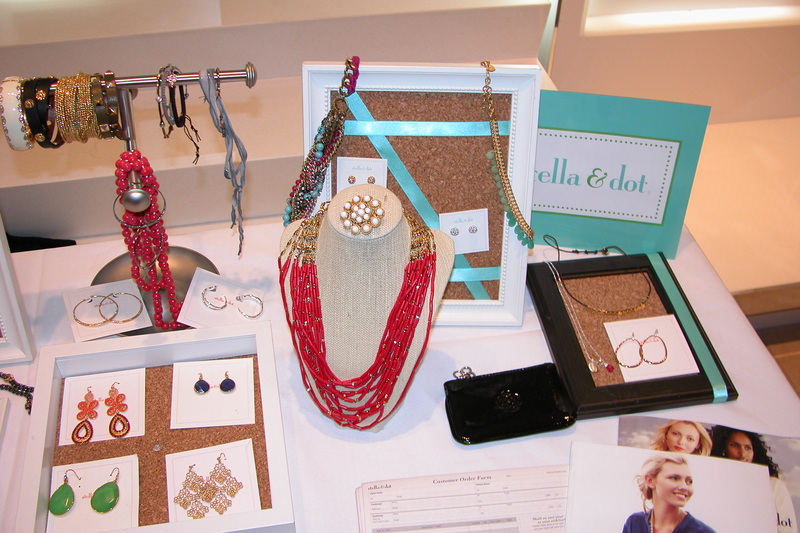 And for those in the market for further fabulous accessories and beautiful jewels, Stella and Dot was on hand to serve those needs. There was a great deal of White Diamond Vodka, a massage table from LaVida Massage, and the food was lovely- but fashionable. So, light. 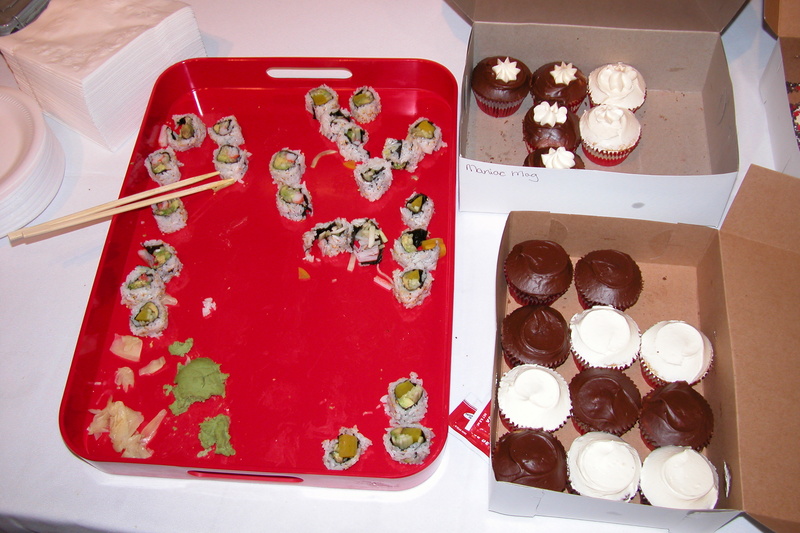 So, sushi and cupcakes. Needless to say, I ate quite a bit of sushi. Which was very nice. Pleather leggings are surprisingly forgiving. 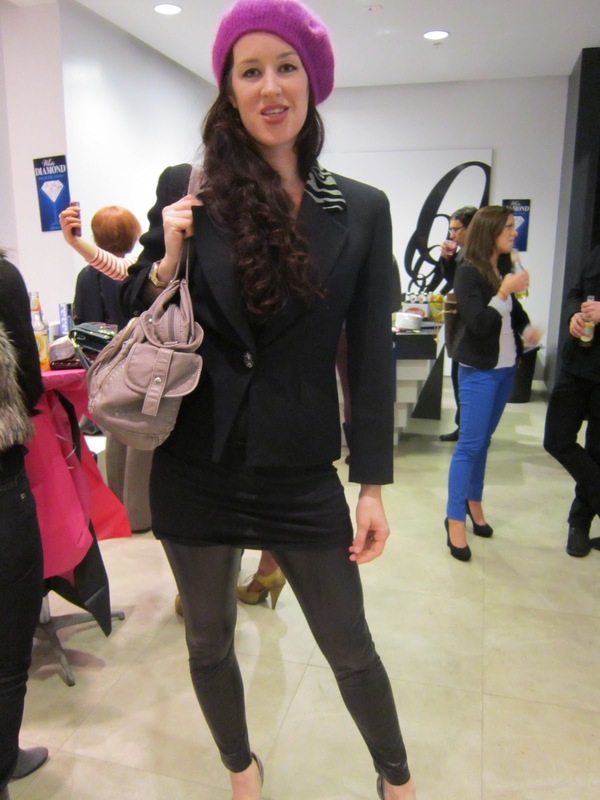 I sipped, and mingled, and photographed, and was delighted to have my fill of sushi and of the world of high fashion. The one thing I didn’t do was get a chance to sit down and seriously apply myself to instantly blogging the new issue of Maniac Magazine. But lots of other people did! You can read all about it here, here, and here– or even better, pick up a copy yourself if you happen to see it at a chic boutique or newstand near you. I am grateful to Maniac Magazine for bringing style back into my life- even if only for a night. And now, if you’ll excuse me, I am off to add another frumpy layer to my current chicken feeding chic outfit. 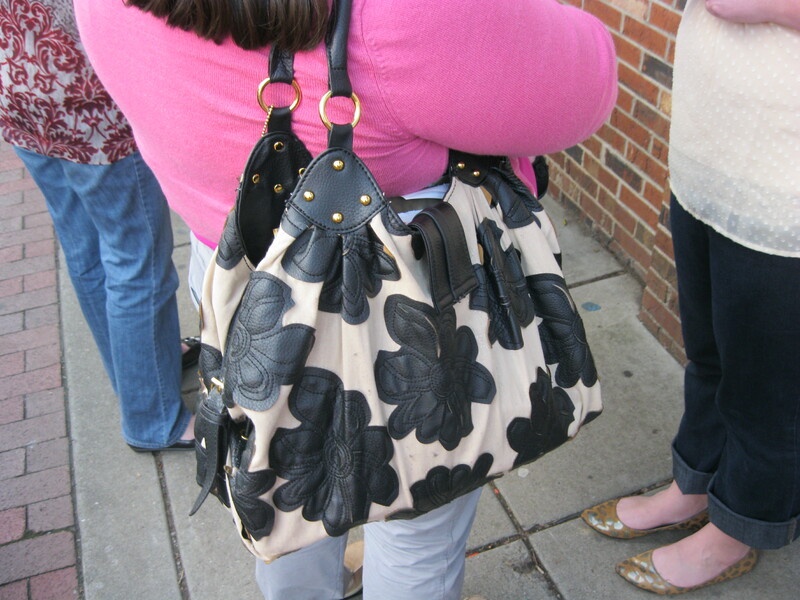 This entry was posted in Kate and tagged Adventure, Fashion, Pittsburgh, style, Urban on February 8, 2012 by sweetridgesisters. On Sunday I left my books and beading behind, and journeyed with Emily past New York and on into the mountainous ranges of Vermont. Emily’s old van spiraled up the curvy mountain roads, ascending above dotted hills of mostly pine timber. Eventually we passed thru Vermont and headed over the New Hampshire state line. The designated destination of the days trip was a roller rink located in rural New Hampshire surrounded by rolling crests of land and a vast still lake. Unlike the calm image shrouding the secluded rink, inside of the establishment high commotion was in session. 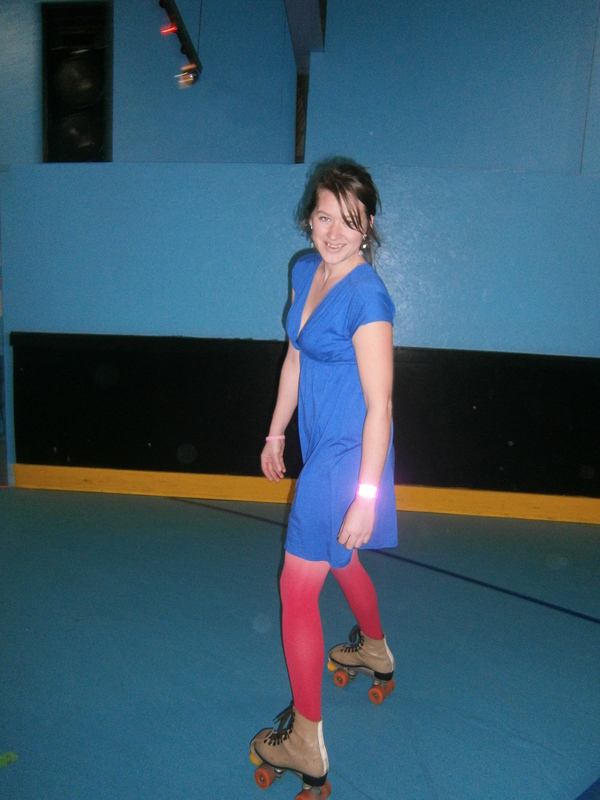 In addition to being a Land Baroness, Emily spends 2-3 nights a week involved with a roller derby team. Her days of playing derby have passed, but she is still as committed as ever to derby and now volunteers her time and talent to acting as a referee at derby bouts. 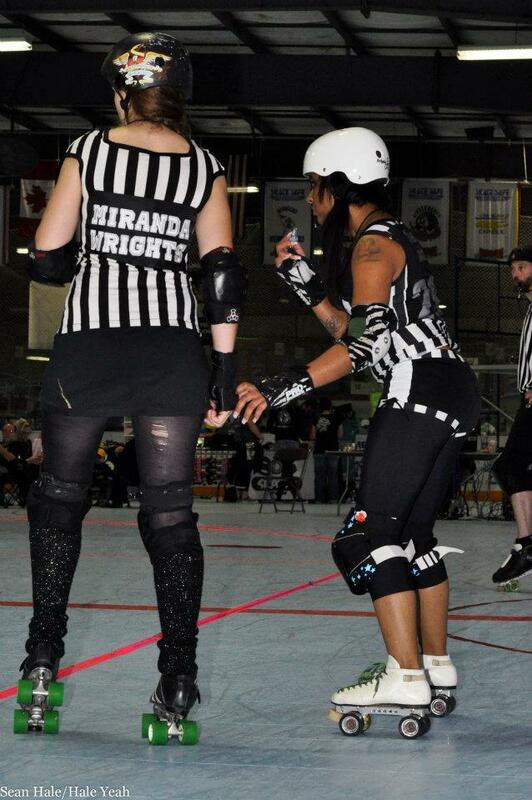 The striped ref jersey that she wears when officiating displays her derby name on the back. While out on a rink floor, Emily Menn becomes Miranda Wrights, which is most appropriate for a lawyer whose derby slang name has a narrative of humor and truth to it. 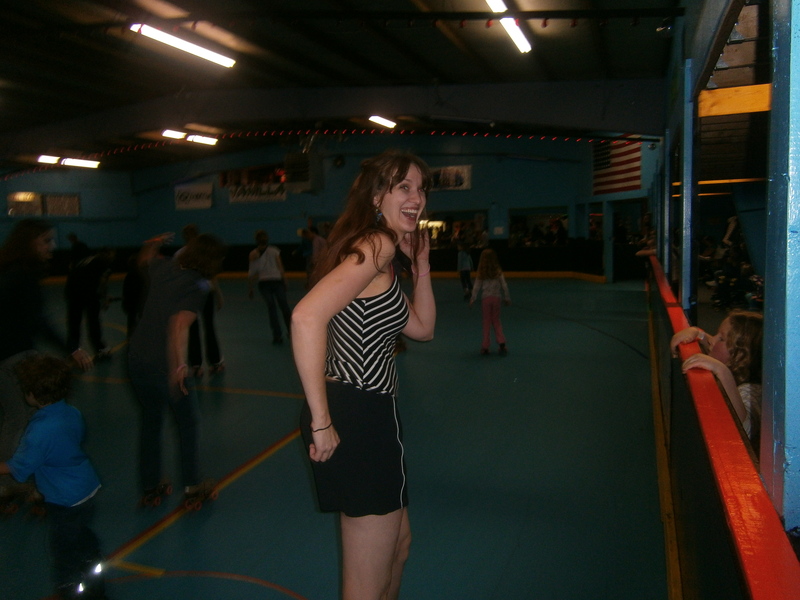 Before Emily got suited up in her stripes, and put on her serious official face, we laced up skates, and hit the rink. Emily shines when she skates. Watching her makes me think of my sister, Kate. Like Kate, Emily is a dancer too. She’s a dancer on wheels who moves with collected rhythm, grace and poise. 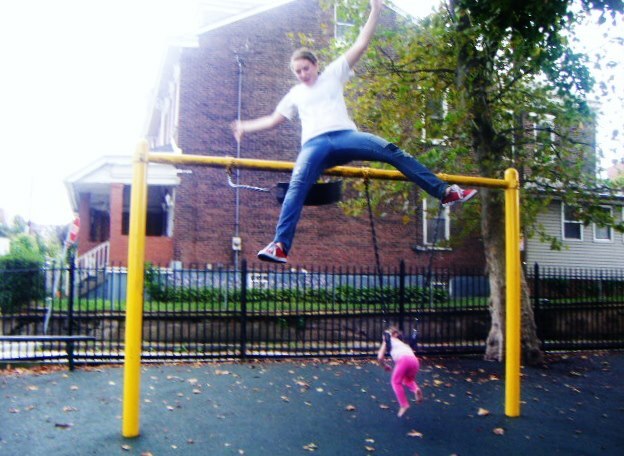 I am not a dancer, and my days as a rollerblading child with bloody knees have long ago passed. However, I discovered that wearing a dress is a fool-proof way to have the incentive to not take any embarrassing spills. At the bouts end, all participants seemed happy with the afternoons calamity. I too was in good spirits, even if my books and beading missed me two states and a steep mountain decent away. 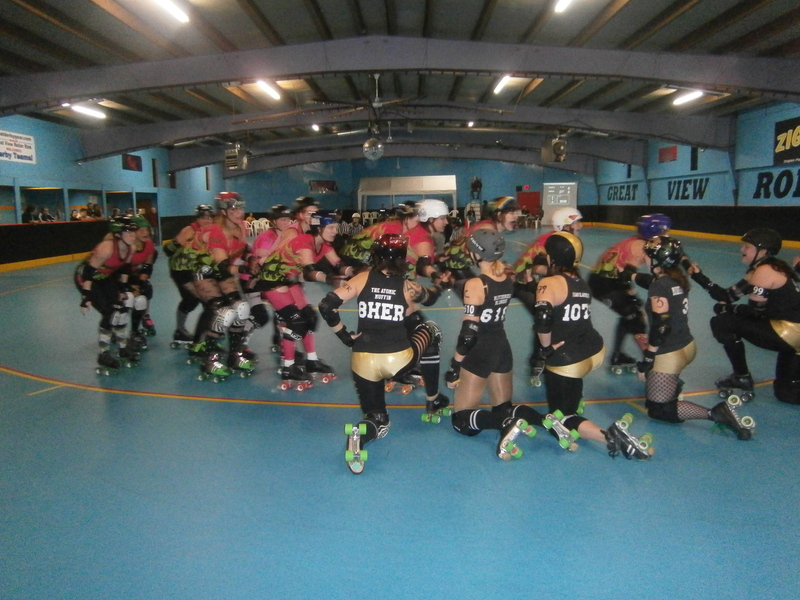 This entry was posted in Mary and tagged Adventure, Roller Derby, style, Travel on February 2, 2012 by sweetridgesisters. Looking at the header on this blog, you may note that there are a more than just the Slattery sister’ gracing the top of grain bin on Kate’s glorious late June wedding day. The maid in the hot pink dress is Emily Menn. 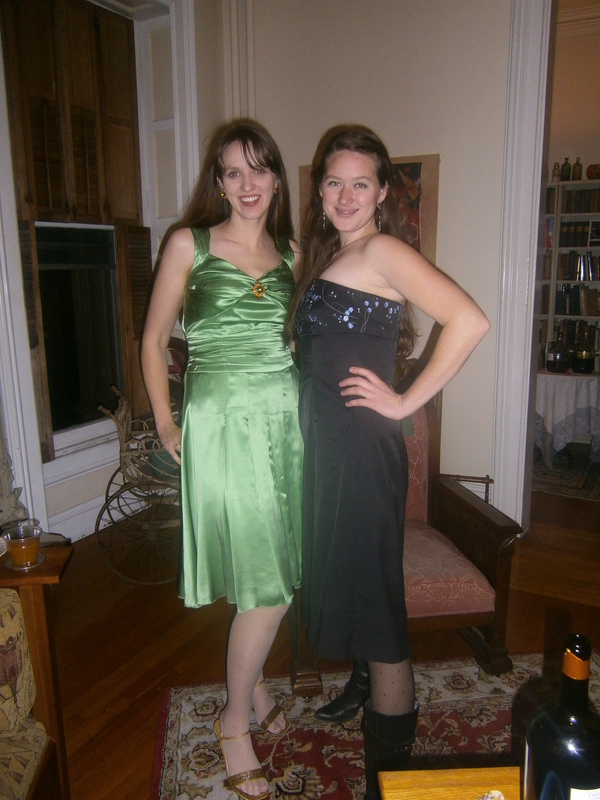 Emily was Kate’s Maid of Honor, and is the older sister of our Sister-In-Law, Aurora. Emily was educated as a lawyer but in more recent times has found herself owning 8 rental properties in Troy, New York. All of her property was constructed in Victorian times. Some apartments were once huge brownstone private family homes. One was built for use as a coach house, another was made to be filled with nuns as a convent. Each have an individual story behind them. The 54 tenants that rent from Em might refer to her as a landlady. Personally, I like to call her a land baroness. For months I have known that I needed to take time away, and go out into the world. Time and distance away from the quiet frozen ground back home has been a much needed desire. In October or November, Emily and I started co-conspiring for me to come to Troy to vacation, or as I like to approach it, work-cation. A few months have passed since the conspiring to take the trip north on the train was presented, and I am happy to report that I have taken the opportunity to come to New York and keep up with Emily’s workaholic stride. 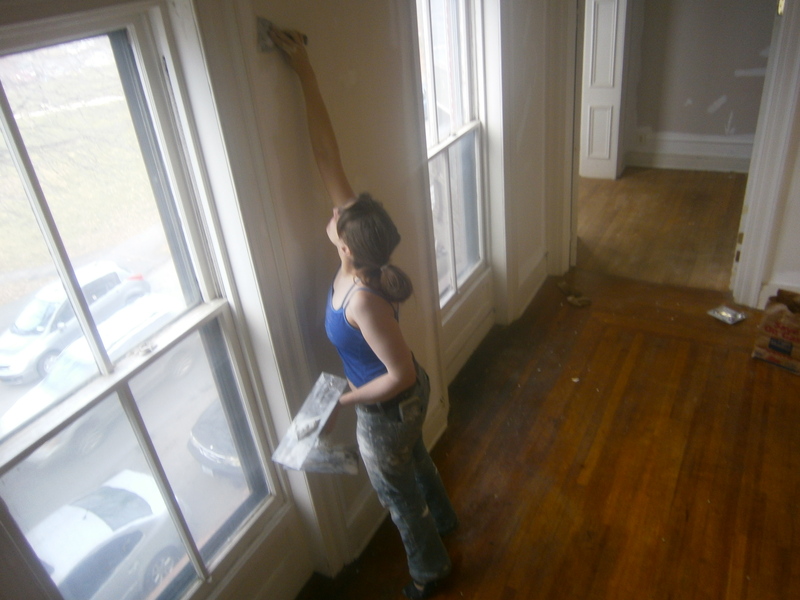 One of the big focuses while I am here is to completely caulk, plaster and paint a large three bedroom apartment. With the past history as my carpenter brother’s semi-useful assistant, I am really enjoying my time learning home improvement skills. There is nothing like a knife, drill, caulk gun, and a bucket full of tools to make a woman feel useful! Most days are filled with paint splatters and caulk. Some days have a different twist though- such as on a recent Saturday. After spending the morning craning my neck sanding down a ceiling , Em and I headed 2 blocks down the street to a rental property. Our task at the apartment there had nothing to do with home improvement skills. Nope. The job there was to attempt to bag and discard of whatever we could. The former occupants had moved out of the house in a hurry. This could have had something to do with a team of US Marshal’s breaking down the door to look for the husband who was on the run due to involvement in illegal sales of certain substances. The past occupants of the apartment left behind 2 floors of things. 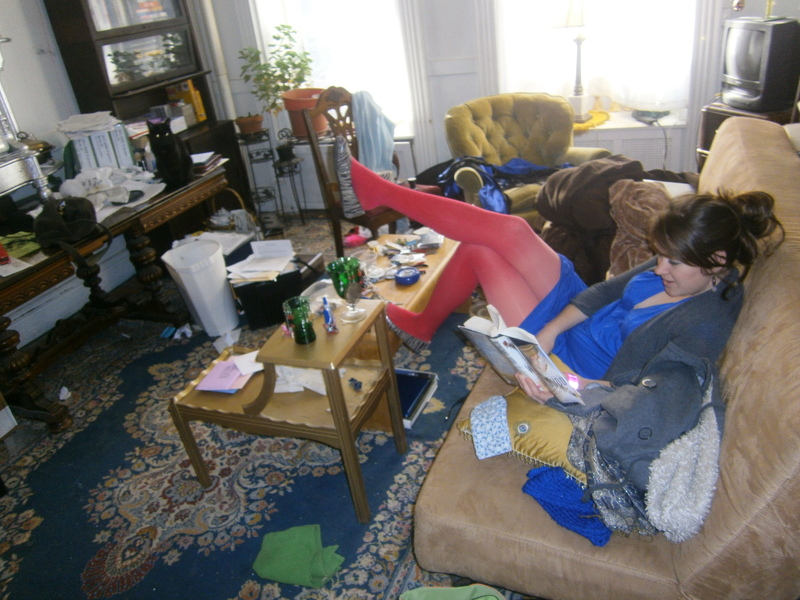 The most humorous finds of the cleanup effort were very different from each other. The first find was a tiny scale that we could say was,uh, a marketing scale. The other find was the collapsed remnants of a baby grand piano in a dark scary corner. Ah, the exciting life of a Property Baroness! When Emily I are not working , sleeping , watching wretched reality tv, or eating (we haven’t wasted the time to turn on burners, so coffee, cereal, ice cream, and microwaved marshmallows are our main substance), we have been known to change our clothes and self renovate. Dressing up and going out for the evening are a rare occasion. More likely than not, my days have been filled with the goodness of busy pleasing labor, and little outside conversation with the exception of the guys on Emily’s payroll who tend to the electrical and craftsman tasks. Recently, Em and I have gone thru a phase of watching reality tv on netflix at night. It’s fun to do while Emily keeps herself busy making a chandelier, and I have thrown myself into a fixation of making copious amounts of jewelry thanks to a bead gallery down the street feeding into my jewelry addiction. The two of us have watched so many episodes of Say Yes To The Dress, that I never want to see a white dress again. Our newest reality tv show marathon has been keeping up with the clicky tattoo artists on LA Ink. I giggle as I watch the trendy culture displayed and copy the “rad” way the washed out Cali stars talk. My joke is that I am going to go home speaking like the stars of the show from the East Coast. That’s hardly likely. For no matter where I am- at heart I’m a mid-western girl. Whether climbing up Sioux grain bins, or on top of a ladder, or standing on 3 inch heels, my roots are within the Wisconsin earth, and so are Em’s. It’s a special gift to share this time and laughter with a kindred sister from the Badger state. This entry was posted in Mary, Uncategorized and tagged Adventure, friends, Home Renovation, Travel on January 26, 2012 by sweetridgesisters. I can’t recall when it was that I learned about the definition for melting pot in history, but on Saturday I was reminded of the expression. 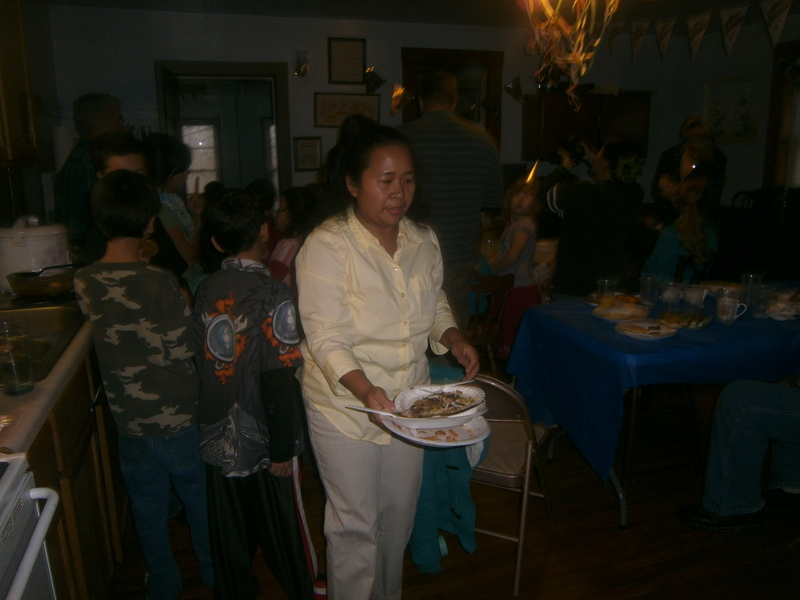 This was due to the fact that I was at my friend Mary Mark’s house which I have dubbed ” The Amish Mansion” and I was eating fantastic traditional Filipino food that was cooked my Mary’s Filipino friends. 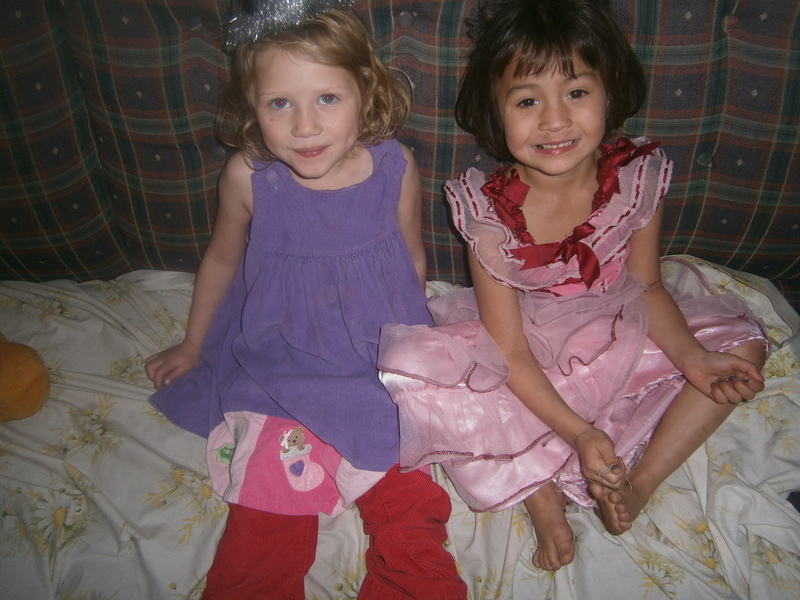 These friends have been a helpful support system to my friend Mary, who was adopted from an orphanage in the Philippines as a girl. 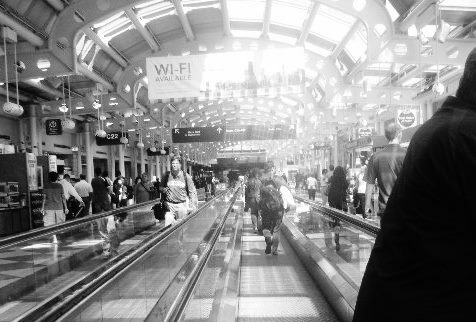 It has been many years since she came to America. Mary now has 2 children of her own, and is expecting her 3rd in March. Here is a photo of her daughter Jade the birthday girl (or monkey as I call her due to her typical habit of hanging off of me) in her pink birthday dress. I know-crazy right? I swear this house must have at least 10 bedrooms, not to mention tons of odd nooks and crawl spaces. Every room in the house is painted the classic light blue shade that the Amish paint all of their walls The story is that a young Amish family built the home and proceeded to have oodles of children(14 I think) who than proceeded to start their own families. One of the children built on a second home that is adjoined to the first by the porch. 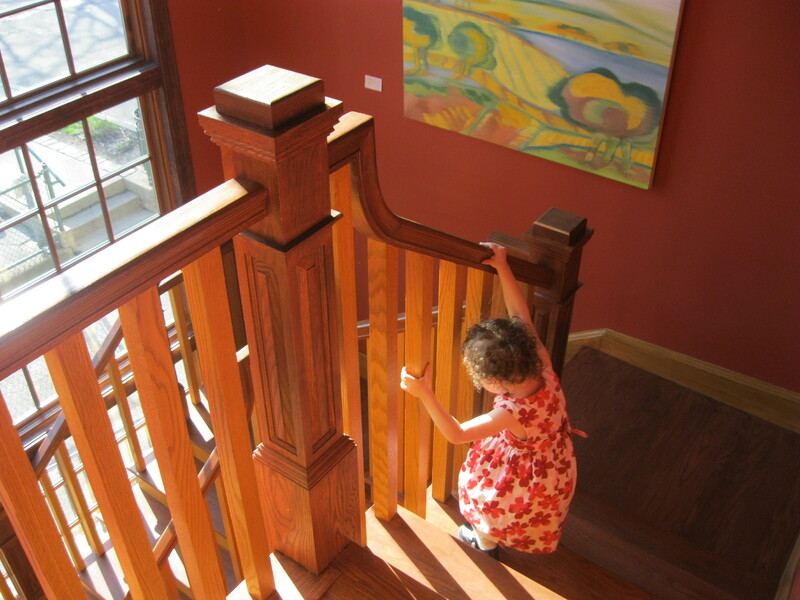 The place is a fantastic house to wander. 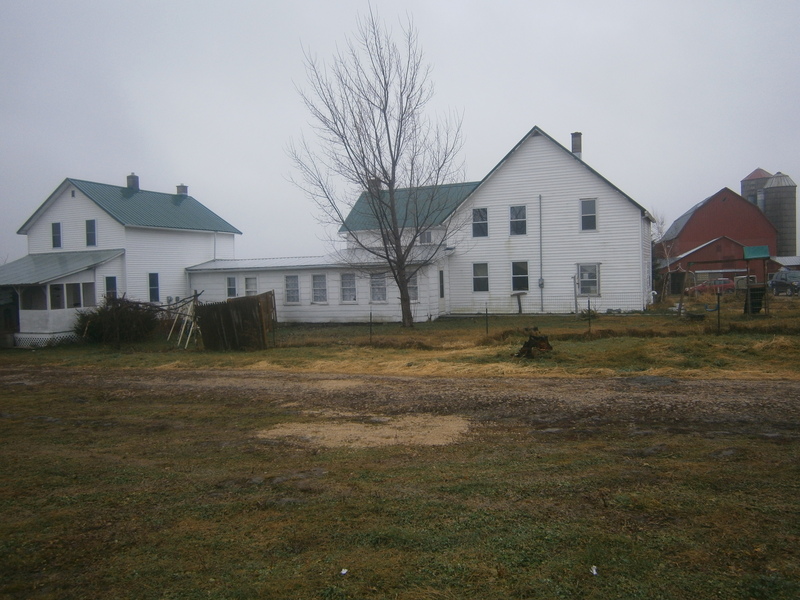 When it was vacant I loved to hunt down plants from the abandoned Amish garden and explore the house, all the while feeling like I was in the midst of a Amish commune or Mormon compound. Gone now are the days of vacancy that existed after the Amish family moved North. Since then indoor plumbing and electricity was installed, and the house has been split into 2 units. Now Mary and her husband live on one side and another young family live in the other half. When I first learned about the phrase melting pot, I thought of European immigrants on Ellis Island. Now the definition has broadened, and yes, it does include a variety of people at a birthday party in an Amish home in rural Wisconsin in the year 2011. 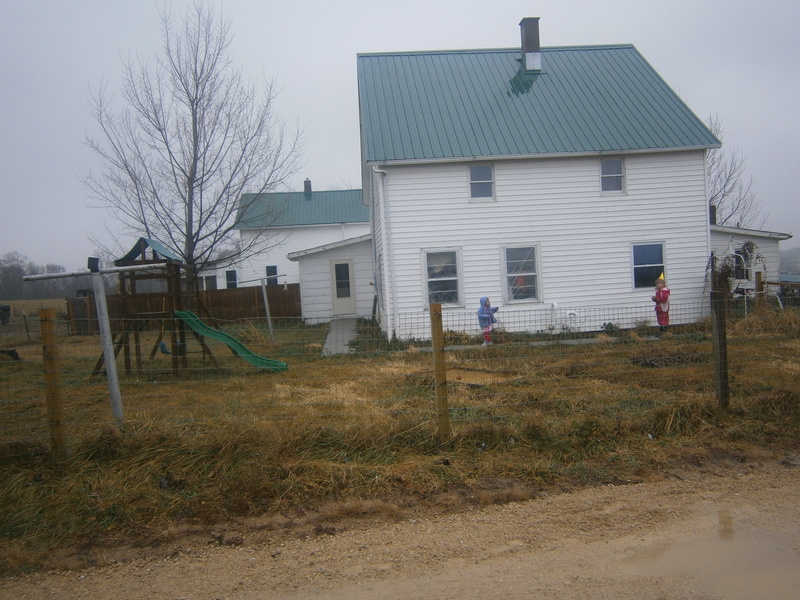 This entry was posted in Mary and tagged Adventure, Amish, Family, Farming, rural on December 2, 2011 by sweetridgesisters.